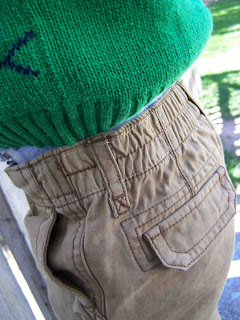 It seems like for a large portion of my childhood I had to wear my pants with a 2 inch pucker at the back of my waist. I'd try to disguise it with a larger belt and a longer shirt, but it was always very difficult to hide. 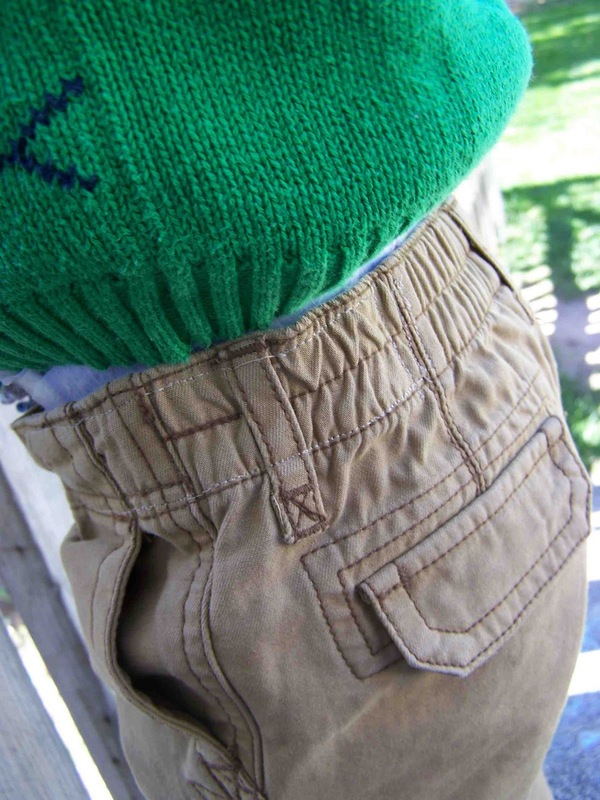 The alternative to having a 2 inch pucker in my waistband was having high water pants that were two inches too short. I definitely preferred having the 2 inch pucker to the 2 inch deficit in leg length. 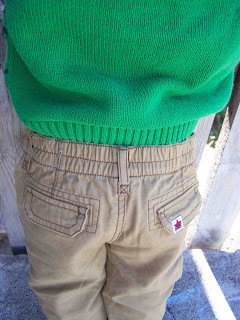 I wish that when I was a little girl there were adjustable waistbands in pants like they make now days. It seems that my almost two year old son is doomed to have the same leg to waist disproportion. I recently found an inexpensive, but pretty cute, pair of pants at Wal-Mart. I of course did not try them on him (would anyone really bother trying clothes on a toddler?). I also failed to see if they had an adjustable waistband. When we got the pants home I was quite pleased with the fit. As we went throughout our day I realized that we had a major problem. My active little boy was wearing his pants beneath his cheeks most of the night. I decided that it was time to solve the problem by creating what every available pair of children's pants should have....an adjustable waistband. It didn't take long, and it has completely resolved the droopy drawers issue (while avoiding the 2 inch pucker). Click "Read More" below for a full tutorial on how to add an adjustable waistband to any pair of pants. Here are the materials I used: Two buttons (you can using matching buttons, but I didn't have any on hand), just make sure that they are the same size. Two pieces of elastic. 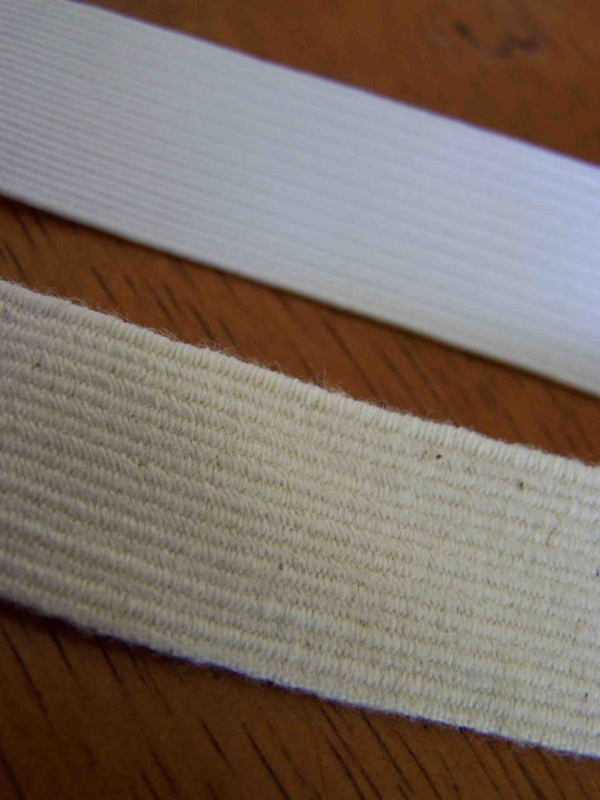 Two strips of soft knit material cut slightly smaller than the width of the waistband on the pants, but at least 3/8" wider than your elastic. For the material I cut up an old knit shirt. The knit material creates a super soft material that irritate your little one's waist. As you can see I used a woven type elastic. It worked well, but I think that the next time I try this I will use a slightly thinner elastic (like one seen below). My button hole stitch a bit of a struggle stitching through the thicker elastic. The cotton elastic would be even softer for sensitive skin. 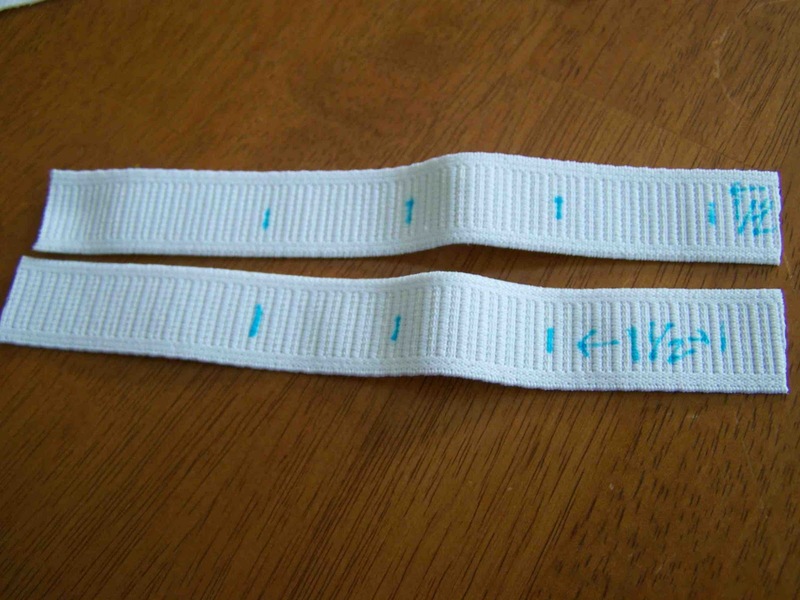 First of all you will want to determine where you want your adjustable waistband to start and stop. I started my waistband on a seam in the back. I wanted the stitching be as inconspicuous as possible. In the front I marked a point for the buttonholes. One buttonhole is hidden below a belt loop, the other wasn't equally spaced on the other side of fly so I measured the same distance from the fly and marked. 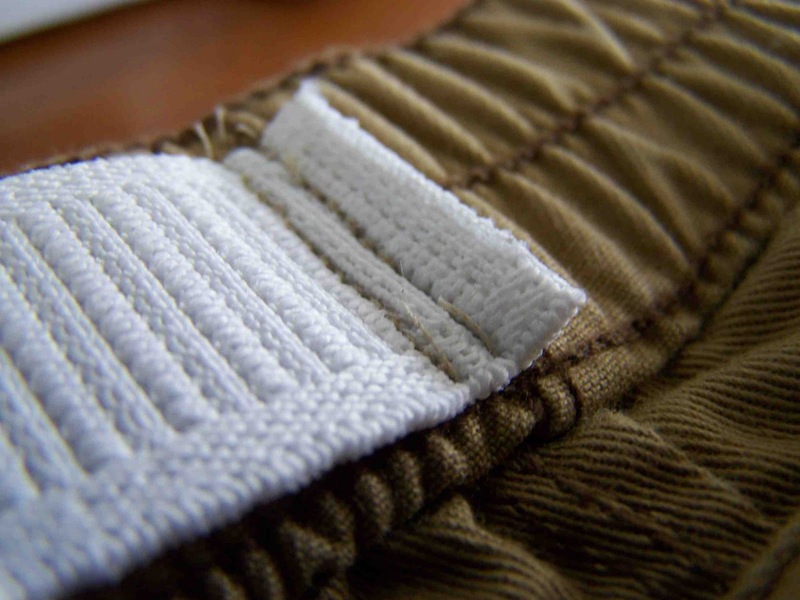 Now that you have marked where your waistband will begin and end it is time to cut your elastic to size. I added 3/4" to the length between the two marks. This is because you will want your first buttonhole to fit overtop of the button, so you'll need space on the other side. 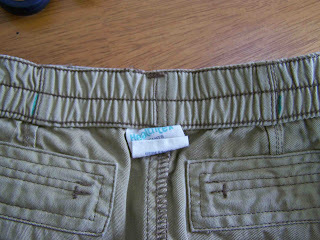 My elastic is cut so that when it is attached on the first buttonhole the pants fit as designed. I figure that there is always a chance that Clark's waist could expand. Next I made markings on my elastic for the buttonholes. I made my first button hole 1/2 inch in from the edge of the elastic. I made four button holes in each piece of elastic, each spaced 1 1/2 inches apart. Four buttons was a bit of an overkill, 3 would have been plenty. If you know exactly how much the waist needs to be taken in you can determine where to place your second buttonholes by spacing them half the distance apart from the first (on either side). Make your buttonholes. My sewing machine has a buttonhole stitch suited specifically for stretch fabrics. See your sewing machine manual for buttonholing details. 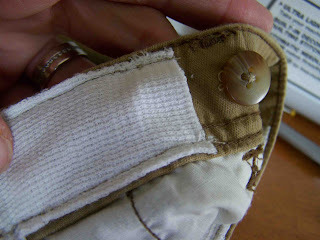 Attach the buttons onto the front of the pants. It's now time to attach the elastic to the pants. 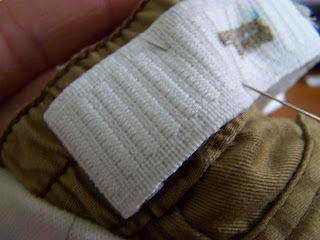 Button the elastic on the first buttonhole to the pants. Pin the elastic to the pants at the back marking. 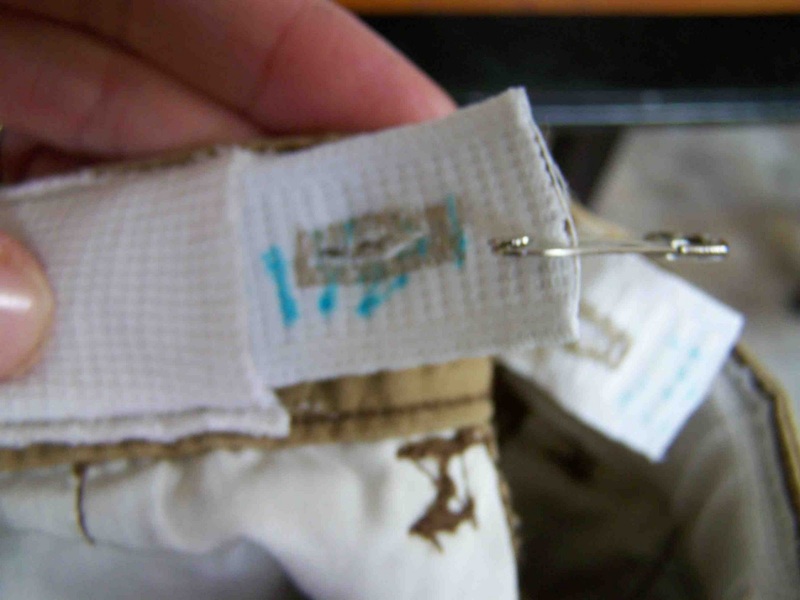 Use a stretch stitch to attach the elastic to the pants. I chose the triple stretch stitch so that it wouldn't be as apparent on the opposite side of the fabric. I stitched in two places to secure the elastic even more. Once the elastic is attached on both sides of your waistband you will want to pin back your elastic so that you can attach the casing for your waistband. 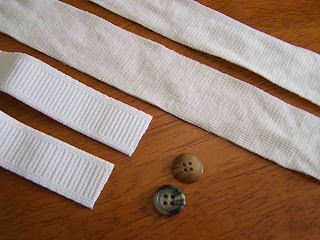 Pin the knit fabric along the waistband of your pants and stitch along the top and bottom sides of the casing. Leave both ends open for now. I left the edges of the knit raw. Knit typically doesn't fray, and I was in a hurry. If you don't want any exposed raw edges you can cut your knit fabric 1/2" wider and turn in and press each side 1/4". Unpin the elastic that is pinned back. 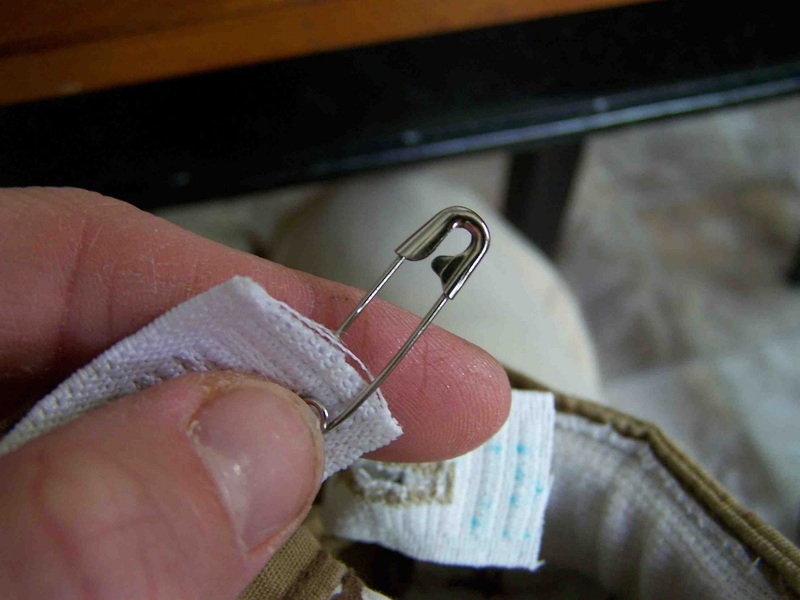 Attach a safety pin on the end of the elastic, and feed the end through your casing. Once your elastic is fed through the casing stitch down the end of your knit casing. That's it. 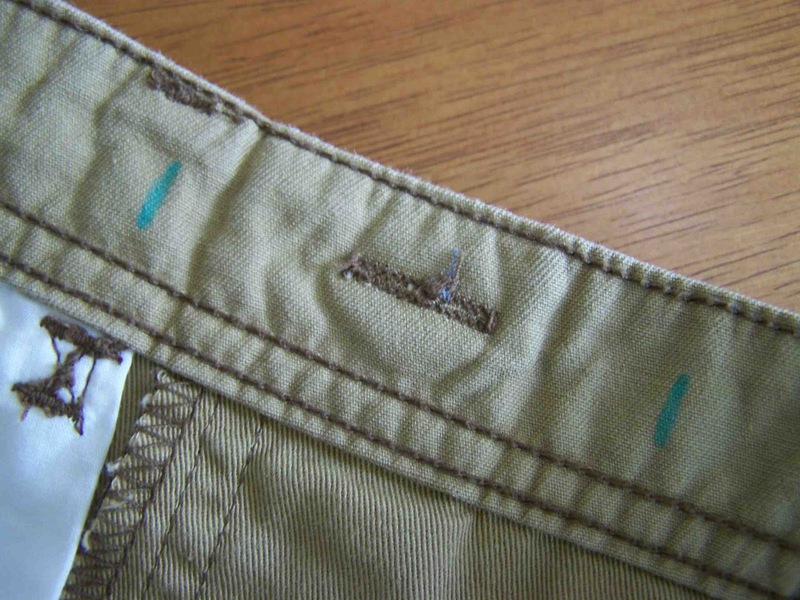 You've created an adjustable waistband for your pants. I applied some fray check to the edges of the elastic and the inside of the buttonholes, but I am not sure that it is necessary. Here's a look at what it looks like on the outside. It's too bad that my thread wasn't a better match, but it gives you a better idea of how it looks. The too big waistband problem is solved and now Clark can run free without his saggy drawers hindering him. Let me know if you have any questions. Sometimes I don't know how clearly I explain steps. Thanks for visiting. While your here check out these great link parties that I'm participating in. Don't forget to enter to win a gift card to CSN Stores here. This is such a brilliant idea! I can think of a few pairs of pants that need one of these. Thanks so much for sharing. Aweseme tutorial!! If it weren't for the adustable waistband, we'd never have pants that fit my daughter! Clever! I have a pair of maternity pants that used the same principle. I'll have to keep this in mind if I need maternity pants again. I love that now we can fix the pants that weren't made with an adjustable waist! Thanks! Love it! Perfect for little boys with no bum! This ver useful infomation! Thank you for sharing! I've had to buy and start wearing a belt - because my pants keep heading south. My thank you is added to all the others. 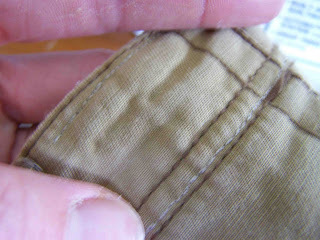 A friend of mine has tried to tell/show me how she had put an elastic - stretchy - waistband in her trousers. All I heard, and saw, was that she had sewn an elastic band along the waistline. Thank you for making it so much clearer for me. Thank you so much for this tutorial! 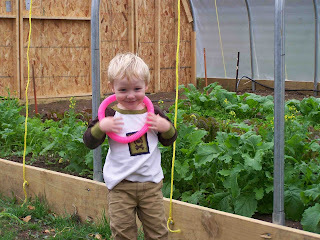 Both my boys are in the 80% percentile for their height and only 10% for their weight. They are skinny and tall and the ONLY pants that stay on either of them (my oldest is 3 1/2 and my younger son just turned 1) are overalls and pants with the adjustable waist built in (or the pj pants I sewed myself). I have been meaning to come up with some sort of fix like this for AGES but just couldn't quite figure it out. You are a LIFESAVER! Now my boys can have pants that fit in the waist AND the length! Well done! 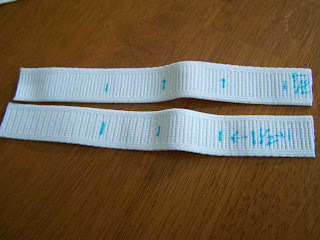 I want to point out that you can buy elastic with the buttonholes already made, which would make this task even easier! Great tutorial. You might consider putting buttonholes at both ends instead of sewing one end down. 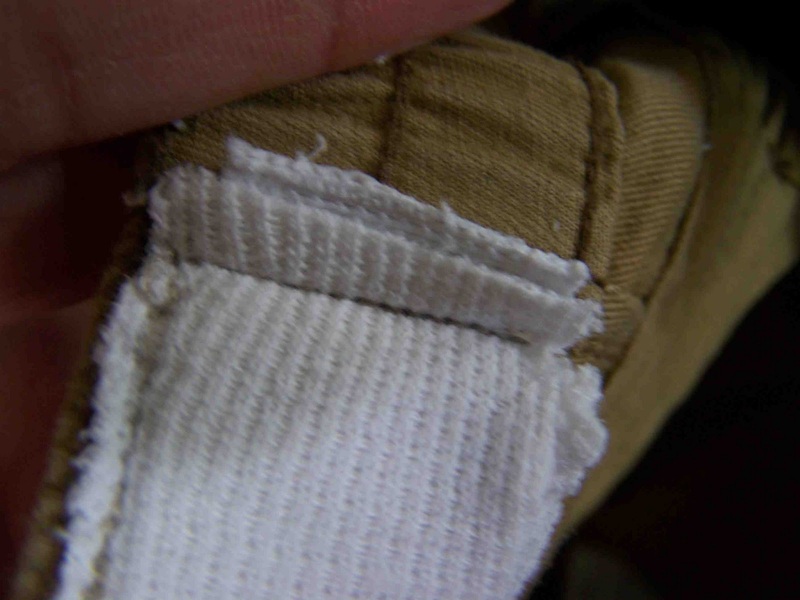 In my experience, if the elastic is sewn down at any point in the casing, when it slips off the button and slides back into the casing, there is no way to retrieve it short of ripping the casing apart. Ask me how many times I've had to do that for my kids! I never even thought of adding that in myself!!!! Both of our boys have the same problem as your little guy (and I did as a kid like you too!) - long legs, and skinny waist. Pants are always falling down... seriously I wear a belt every single day. Pretty sure I'll be looking for some good deals on elastic over the next week or so, and sewing up a storm! You're a genius! Great tutorial! I've done it with my daughter's pants, but always used the existing waist instead of adding a casing, I think next time I'll add a casing, especially on the ones that already have elastic there. You can buy elastic with button holes in it. I get it at Joanne Fabrics, it's usually precut. at fabricland they have elastic that already has the buttonholes in it. I didn't know what it was for (I bought some just because it was cheaper at one point) but it would be great for this and would save you the hassle of putting in all the holes. not sure if someone already mentioned that in the comments. What's the 2nd button for?